CLEAR LAKE, Man. 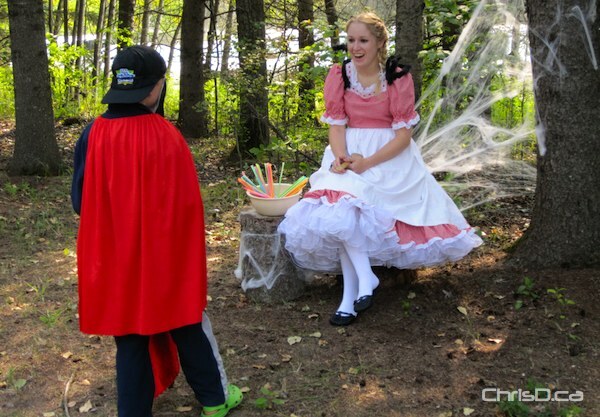 — Ghosts and goblins don’t usually appear until late October, but in Clear Lake over the weekend, an exception was made. Children ran up and down the streets of Wasagaming, Manitoba on Saturday collecting candy as part of Manitoba Homecoming 2010’s weekend celebrations. Stores and restaurants in the downtown area handed out sugary treats to anyone dressed up in a costume for “Boo in the Park” — adults excluded, of course. The New Chalet hotel drew the most attention for their makeshift cemetery display, complete with a fogging machine and freshly-dug grave sites. Further down Wasagaming Drive, it was shoulder to shoulder foot traffic as tourists wandered in and out of shops under sunny skies and mild August temperatures. Washington, Minnesota, Alberta, B.C., and Ontario — just some of the out-of-province licence plates that lined the street on Saturday. The highlight of the evening was the spectacular concert put on my Winnipeg songstress Sierra Noble and Portage la Prairie’s Doc Walker. By early Saturday morning, crews were setting up the stage in the lakefront park, testing lights and performing sound check. Mere hours later, eager fans were already setting up their lawn chairs front and centre on the grass. By 7 p.m. the show was underway and it was a challenge to find a foot that wasn’t tapping to the beat. Sierra Noble took the stage first and engaged the crowd in a conversation about her admiration for Folklorama. After getting her feel for the audience and becoming set in her groove, Noble performed a stellar rendition of The Beatles’ “Day Tripper,” who she introduced as four guys from England whom you may know as The Beatles. Noble ended her set with an extended fast-paced song on the fiddle, which she is known for more than her singing. “I want everybody to get up,” she belted, as the laid back audience made up of both young and old fans stood up from their lawn chairs. Following what was an energizing opening act, Noble urged those in attendance to stick around and meet her in the nearby bandstand gazebo, even if it was a small plug to go and buy her CD. Money definitely well spent for those who took her up on the offer. 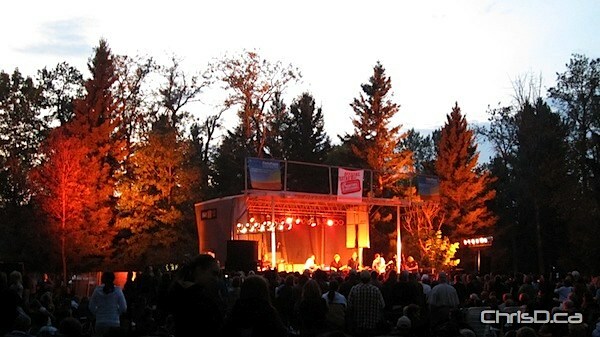 As the crowd stretched and walked around during a 35-minute intermission while Doc Walker prepared to go on, the sun began to set on what couldn’t have been a more perfect day in Riding Mountain National Park. The stage lights were brought up again at around 8:30 p.m. as Chris Thorsteinson, Dave Wasyliw and Murray Pulver greeted the fans who were cheering the band’s name for several minutes before they appeared. 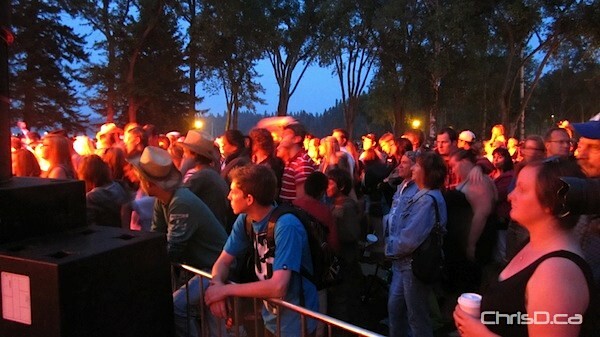 While the atmosphere was more relaxed for Sierra Noble, the crowd clearly came for Doc Walker, as it was standing room only for most of the show as bright LCD screens could be seen above heads as pictures from every angle were being snapped. And it wouldn’t be a Doc Walker concert without hearing their smash hit, That’s All. Even if you aren’t a country music fan, or aren’t familiar with the genre, you would have recognized the song from the air play it received, which helped the band pick up five CCMAs in 2008 for their album Beautiful Life. Organizers on scene estimated about 5,000 people were in attendance, which Parks Canada says is the most people Clear Lake has seen in recent memory. With so many people converging on what’s normally a quiet resort town, parking was hard to come by. The main strip was full by 11 a.m., and overflow spots were being taken advantage of, including some creative, yet not so legal, parking jobs. The three days of events at Clear Lake began Friday, and organizers did a fantastic job of every bit of it. Both Parks Canada and Manitoba Homecoming 2010 were running as well-oiled machines to make sure everyone was having a fun time. On the crime front, the RCMP weren’t reporting any major incidents, as additional officers were brought in from surrounding detachments to handle crowd control. Following a rash of vandalism in the Wasgaming town site on August 12, including smashed store windows and an overturned Parks Canada electric vehicle, there was a subdued, peaceful feeling over the weekend, in what many considered the last big hurrah of the summer.